(Santa Ana) – The Orange County Health Care Agency has received confirmation from the California Department of Public Health (CDPH) that three patients in Orange County have tested positive for enterovirus D68. The three patients, all of them children, are unrelated and are not linked with any community outbreak of the illness. There has been an increase in enterovirus D68 reported across the country over the last few months, resulting in enhanced surveillance locally. “Due to the heightened awareness and surveillance for enterovirus D68, it is not surprising to identify cases in Orange County’” said Dr. Eric Handler, Public Health Officer. Individual cases of enterovirus D68 have also been reported in communities throughout the state, including several counties in Southern California, but outbreaks of respiratory illness have not been reported in California. Enterovirus D68 virus spreads from person to person when an infected person coughs, sneezes, or touches contaminated surfaces. Symptoms may include runny nose, sneezing, cough, and body and muscle aches. Children with enterovirus D68 infection generally do not have fever; when present, the fever is usually low-grade. Some children have more serious illness, manifesting as breathing difficulty and wheezing. Children with asthma are more likely to have severe respiratory illness. 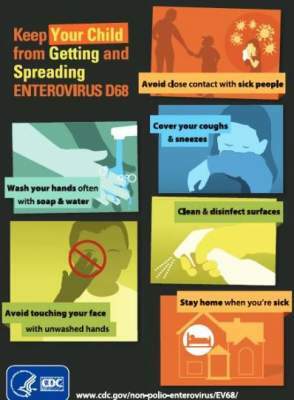 Additional information about enterovirus D68 can be found on the OC Health Care Agency website or CDC website.